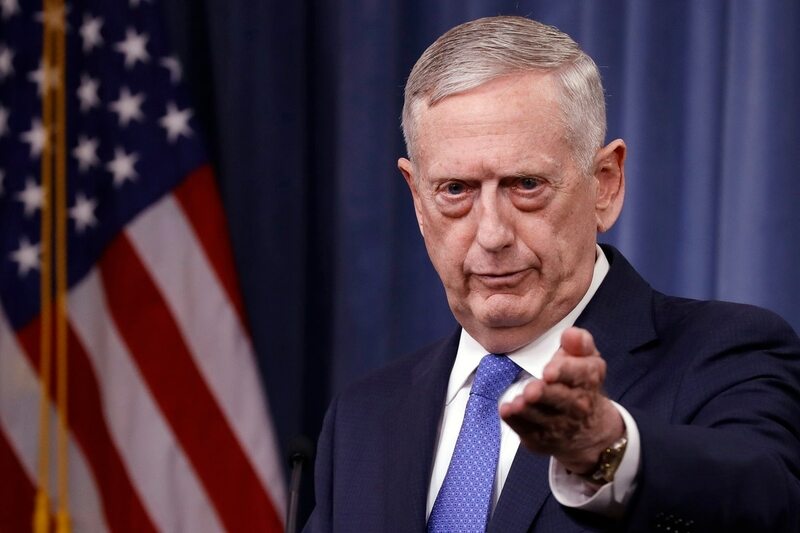 WASHINGTON — The Pentagon's approach to defeating the Islamic State is now defined as merciless annihilation, Defense Secretary Jim Mattis said Friday, summarizing what's become a more aggressive effort in Syria, Iraq and beyond to prevent the group's foreign fighters specifically from escaping its strongholds once local allies have them cornered. "The foreign fighters are the strategic threat should they return home to Tunis, to Kuala Lumpur, to Paris, to Detroit. Wherever," Mattis said. "By taking the time to deconflict, to surround and then attack, we carry out the annihilation campaign so we don't simply transplant this problem from one location to another." The Pentagon's approach to defeating the Islamic State is now defined as merciless annihilation, Defense Secretary Jim Mattis said March 19, 2017, describing what's become a more aggressive effort in Syria, Iraq and beyond to prevent the group's foreign fighters specifically from escaping its strongholds once local allies have them trapped. Mattis addressed the Pentagon press corps to explain how the U.S.-led coalition has endeavored to meet President Donald Trump's directive, issued at the beginning of his administration, to bring greater force to bear on ISIS in Syria and Iraq and, it is hoped, to disrupt the group's ability to gain a foothold elsewhere. The secretary was flanked by his top general, Joint Chiefs Chairman Gen. Joseph Dunford, and the ISIS coalition's presidential envoy, Brett McGurk. The trio cited data points intended to showcase progress: more than 55 percent of ISIS territory has been retaken in Syria and Iraq; more than 4 million people have been liberated. "And not one inch of territory seized from ISIS has been recaptured by them," they noted. "Our strategic approach," Dunford said, "is to cut the connectivity between ISIS affiliates and associates, ... their illicit resources and their message. Our objective is to drive down ISIS's capability to a point where local forces, with tailored support from the international community, are able to provide security. And we're doing this today in Libya, Somalia and Syria, Yemen and Afghanistan." Yet despite their confident tone, some important questions remain. It's unclear, for instance, the extent to which U.S. troops will be needed long term. There are fewer than 10,000 Americans spread between Syria and Iraq, with thousands more deployed close by in Jordan and Kuwait. Mattis is said to be negotiating plans for leaving a residual force spread between various Iraqi military facilities, but he indicated Friday a desire to avoid an open-ended commitment in Syria where, combined with the Islamic State's murderous tyranny, a ferocious civil war has displaced millions. "I'm not willing to sign up for that. That's not our intent," Mattis replied when asked whether American personnel could remain in Syria indefinitely. "We're there to drive ISIS to its knees. ... There's got to be a political solution to the larger issues there. It's not going to be U.S. troops at the point of a gun making that happen." It's also unclear when the group's de facto capital in Raqqa might fall, an eagerly awaited development that would be seen as a symbolic victory for the coalition and a blow to ISIS given its ambition to establish a caliphate. Backed by U.S. military advisers and American firepower, thousands of Arab and Kurdish fighters have nearly encircled the city, but Mattis declined to offer an assessment beyond to say it will be difficult once local forces enter Raqqa, and that he intends to afford commanders the time they need to completely isolate those inside so they cannot flee. "What will it look like when we say that we've got success?" Mattis said. "I think what we'll see is the local security forces, police, that sort of organization that can handle it. ... Police can't handle a force that's driving tanks and using artillery, or has thousands of fighters in mobile vehicles that allow them to range far and wide." And there's also the matter of stabilizing these areas once ISIS is gone. Again, though, no easy answers. Such planning is underway, McGurk said, but there is much that's yet to be resolved. The focus, he said, is on low-cost, locally led projects that will enable displaced people to return home. Establishing local police forces will be an important piece of that, but so will restoring water and electricity. "Stabilization is not nation building," McGurk added, using a term that's become synonymous with the mostly fruitless, years-long military occupations in Afghanistan and Iraq. "We're not attempting to dictate political outcomes nor is it long-term reconstruction where projects are chosen by outsiders often with no connection to the local community, costing and often wasting billions of dollars." Like the Islamic State's stronghold of Mosul in Iraq, Raqqa is heavily fortified and the coalition is bracing for a gritty, months-long fight through dense urban neighborhoods. After those cities are liberated, commanders will turn their attention to other areas where ISIS has amassed. In Syria, that includes a swath of territory stretching to the southeast from Deir el-Zour, through an open valley along the Euphrates River, to the Iraqi border town of al-Qaim. Syria's embattled president, Bashar al Assad, has indicated he intends to reassert government authority in that region, making the Russian military vitally important to ensure the anti-ISIS campaign can continue without interference, officials said. Russia and the U.S. have established deconfliction zones throughout the country. The phrase refers both to times and locations where both militaries agree not to impede one another's objectives. "We are looking for the Russians to work with the regime" as the U.S. and its allies begin to concentrate on ISIS territory in the mid-Euphrates valley, Dunford said. The chairman alluded to a plan that's being co-developed among officials in Washington and Moscow to further "ensure that we can continue to take the campaign to ISIS and ensure the safety of our personnel." He declined to elaborate, but characterized Russians' response as "enthusiastic." Another area of increasing concern is in southern Syria, where on Thursday the U.S. struck Assad loyalists as they advanced on an American training camp — apparently in defiance of Russian demands for them to stand down. Mattis said Friday that it appears these fighters were affiliated with Iran, which along with the militant group Hezbollah continues to back Assad in his conflict with an anti-government opposition. "I don't know there were Iranians on the ground, but Iranian-directed forces," he added. "Iran's activities [in Syria] have not been helpful. They've been hurtful," said Mattis, a retired Marine Corps general whom many believe was forced out as the head of the U.S. Central Command because he objected to President Obama's pursuit of a nuclear accord with Tehran. "They've extended a war that should have ended long ago. "I've been in a lot of refugee camps over my years on active duty from — from the Dalmatian Coast to Africa and other places, seen boat people pulled out of the water off Vietnam. I have never seen refugees as traumatized as I've seen come out of Syria. Never. And Iran bears no little responsibility for that situation."